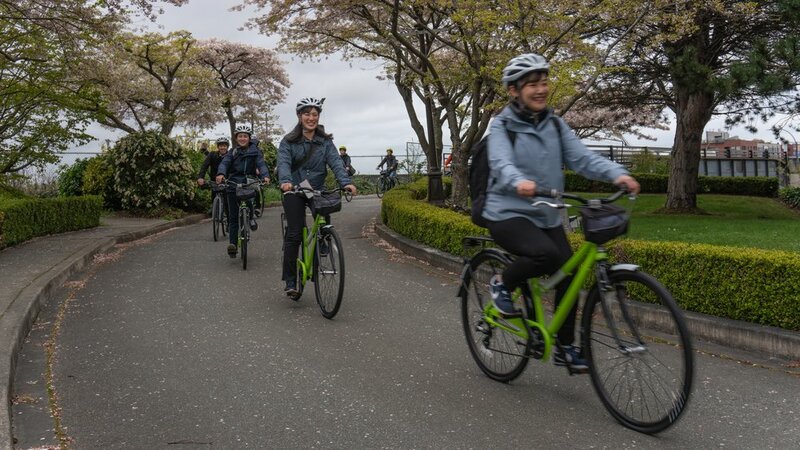 Spring is certainly here; while we’re craving sunshine right now, the flowers are out in full bloom and we’re getting ready for another busy summer of bike tours. We have three key bike tours this year and will also be offering private tours and flexible start times for cruise ship passengers. We also have a new fleet of comfortable Evo and Opus bikes that have already been out on a few trips. Japanese tourism professionals hosted by Tourism Victoria joined us for a City Highlights tour in early April. All of our tours continue to start from the North48 bike shop in Market Square (find us on Google Maps). We have three group tours, ranging from 3 to 5 hours, each with a different focus aimed at providing visitors with authentic local experiences (and really good food). We pass by the working inner harbour and historic Fairmont Empress hotel on the way to the Parliament buildings. Victoria has more restaurants per capita than anywhere else in Canada! We’re a little food-obsessed here. There are new cafés, bakeries, and craft breweries starting up all the time! This tour gives you an opportunity to sample some of the best. You’ll see lots of these Food Eco District (FED) planters around town this year. You’ll notice a lot of construction happening in Victoria’s downtown right now. This is a good thing! New bike lanes will connect the new Johnson Street Bridge to Wharf Street, which lines the inner harbour and connects to two separated bike lanes that cross town—Pandora and Fort streets. It has never been better to be a cyclist here. As usual, there is a lot going on in the city this summer. From music festivals and boat races to parades and one of our favourites, Car Free YYJ. The Royal BC Museum will be featuring a Mayan exhibition from May to September and Friday Nights on the Breakwater Barge is returning with weekly live music and food trucks. We’re really looking forward to Moss Street Market’s summer markets, which start up in May (they go all year but the summer market is larger). Check out Tourism Victoria’s events calendar to see what’s happening while you’re here. We hope to see you out on a bike tour this year! In the meantime, follow us on Instagram for the highlights.